Roast rack of lamb with a crunchy garlic fennel crust makes a beautiful addition to your holiday table. Whether you are looking for a Christmas alternative to turkey or prime rib, or want something truly impressive for New Year’s Eve, this special dish has you covered. The crunchy coating of garlic, fennel, and herbs compliments the tender, juicy lamb and makes a deliciously impressive main dish. Read on for my tips and learn why making roast rack of lamb at home is actually quite simple. For many Americans lamb is not a meat that we commonly eat. It has a distinct, almost gamey flavor, that makes it truly different compared to chicken, beef, and pork selections. Often it’s a dish we leave to professional chefs in fancy restaurants, but we shouldn’t! Afterall, if you can cook beef at home, you can cook lamb. Roast rack of lamb being the easiest of them all. This garlic fennel crusted roast rack of lamb plays to the unique flavor of the lamb while using a traditional one-step roasting method. All together it makes roast rack of lamb a perfectly simple centerpiece for your holiday celebration. It smells amazing, it looks gorgeous, and it tastes delicious – all the requirements for a special occasion meal. Once you’ve tried your hand at roast rack of lamb, it’s a dish you’ll turn to for any special occasion. 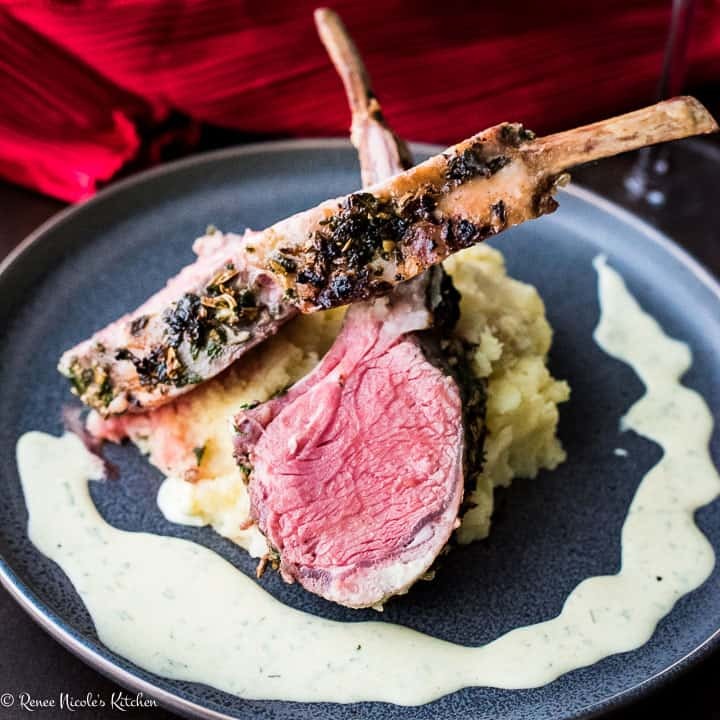 Whether you are celebrating a birthday, anniversary, Christmas, or New Years, make this year’s celebration a culinary feast to remember with garlic fennel crusted roast rack of lamb. 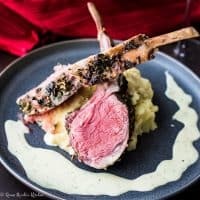 The most important ingredient in this garlic fennel crusted roast rack of lamb is the rack of lamb itself. Rack of lamb comes from the rib cut, which is the tenderest and most expensive part of the lamb. As individual steaks, this cut is referred to as lamb chops, but when kept together it’s a rack of lamb. For the prettiest presentation, use a French trimmed rack of lamb. 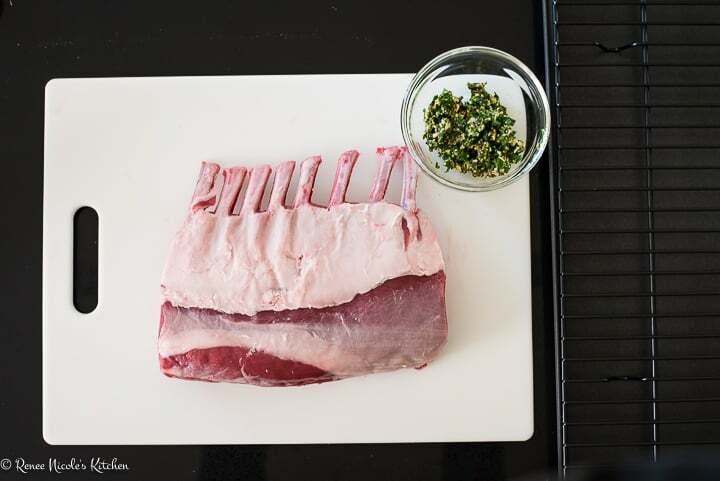 To French trim a rack of lamb, remove a couple inches of rib meat, leaving the bone exposed. 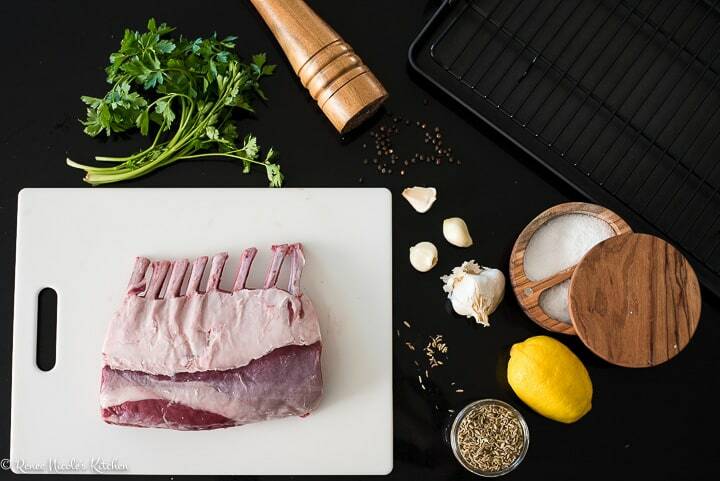 Depending on your grocer, you may find French trim rack of lamb readily available, but if not you can ask your butcher to do it for you. Alternatively, you can do it yourself. I’ve sourced two videos one from Gordon Ramsey and one from the Culinary Institute of America to show you how you can do it yourself. After the rib meat has been trimmed, you may notice that the top side of the rack of lamb (the rib bones should point downward) will have an extra layer of fat on the back. While some of it is good for adding flavor, a thick fat cap is unnecessary. I like to trim away most of it to expose the meat below, which allows the flavors of the rub to really get into the meat. Our rack of lamb features a garlic fennel crust, which starts as a garlic fennel rub. The rub features whole fennel seeds, garlic cloves, fresh parsley, and lemon zest. You can make it by finely chopping all the ingredients, but you can also save a lot of time and effort by using a mini food chopper instead. If using a food chopper, don’t put the olive oil in straight away. Since the quantity of rub is fairly small, the olive oil will make the ingredients stick to the sides of the container rather than let the blade do the work. Instead, add the olive oil after the other ingredients have been chopped up. One your rack of lamb is trimmed and your rub prepared, it’s time for the fun part! You will need a roasting pan fitted with a rack that is oven safe up to 400 degrees. We are roasting at 375, but there should always be some wiggle room or you’ll risk damaging your equipment. The rack helps the dry air circulate around the meat, encouraging even browning and no soggy spots where the lamb is resting. Slather the lamb in the rub, then place the rack of lamb on the roasting rack with the bones curving downward. As I said before, if you can cook beef, you can cook lamb. The secret, as in most meat applications, is to take the guesswork out of your preparation by using a meat thermometer. The best style of meat thermometer is an oven safe probe that stays in the meat throughout the cooking process. I received mine as a wedding present and I won’t grill without it. In my kitchen I use the probe that attaches to my oven. If you only have an instant read style thermometer, it will work. Just remember to check early and be aware that opening and closing the oven door affects the oven temperature and can extend cooking time. Neither of these are necessarily bad, but you may need to adjust the cooking time. Depending on the weight, it should take between 20 and 30 minutes at 375ºF for rack of lamb to reach an internal temperature of 125ºF. After a covered 10 minute rest, the temperature will continue to rise, giving you a perfect medium rare as pictured. For other levels of doneness, please see the chart below and don’t forget that the temperature will continue to rise during the 10 minute, covered rest. 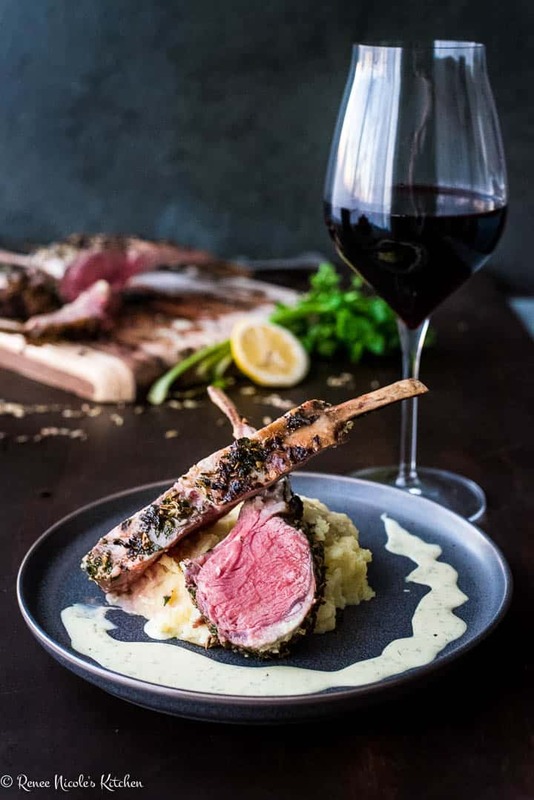 Tender, juicy roast rack of lamb with a garlic fennel crust makes a gorgeous entree for your next celebration. Whether you are celebrating Christmas, New Years, a birthday or anniversary, you can’t go wrong with roasted rack of lamb. Delicious on it’s own, I like to serve garlic fennel roast rack of lamb with a classic bearnaise sauce. The anise flavor present in both the tarragon and fennel makes bearnaise an ideal compliment. My favorite recipe is the Foolproof Bearnaise from Serious Eats. Similar to hollandaise sauce, a bearnaise is a fat in water emulsion that can’t be made in advance or reheated. So, there are plenty of recipes for fake bearnaise floating around. If you have to fake it, check out the Faux Bearnaise Sauce by The Smoking Meat Forums. For a classic menu try this roast rack of lamb with screaming skillet green beans, roasted heirloom carrots, and garlic mashed potatoes. For something a little more fun try it with polenta and balsamic brussels sprouts. 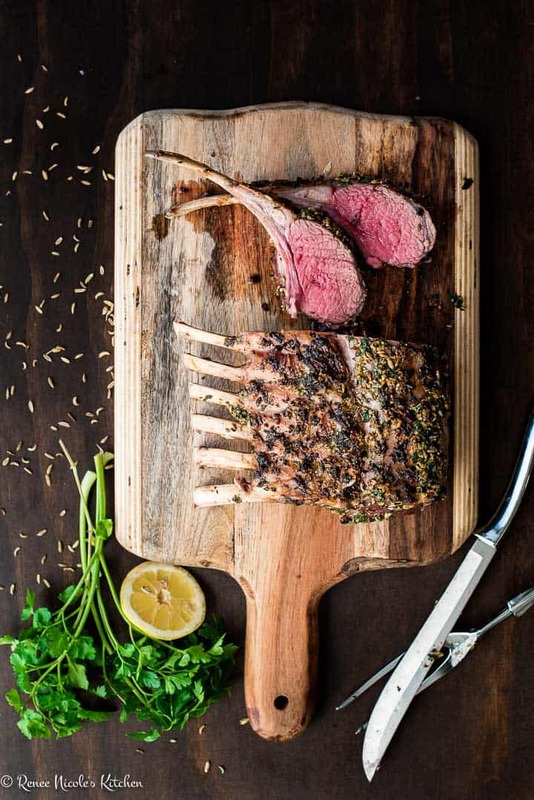 Tender, juicy roast rack of lamb with a garlic fennel crust. A gorgeous entree for dinner parties, special occasions, and holiday entertaining at home. Preheat oven to 375 degrees and prepare an oven safe roasting pan fitted with a rack. Trim any excess fat from the rack of lamb and pat dry with a clean towel or paper towels. 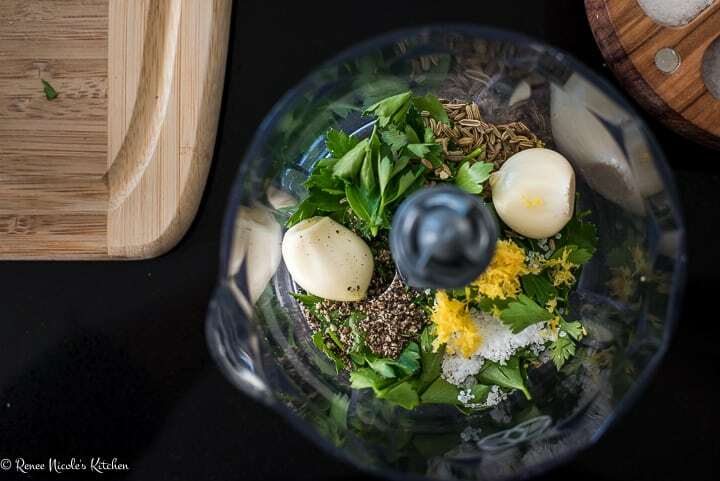 In a mini food chopper or small food processor combine the garlic, fennel seeds, parsley, lemon zest, pepper, and salt. Pulse a few times to chop thoroughly. Add the olive oil and pulse a couple more times to combine. Run the garlic fennel mixture over all surfaces of the lamb. Place the rack of lamb on the roasting pan with the bones curving downward. Insert the probe thermometer into the thickest part of the rack of lamb, being careful not to hit the bones. Roast the rack of lamb at 375º until the internal temperature reaches 125º for medium rare or 135º for medium. Remove the roast from the oven, cover and rest for 10 minutes. Slice and serve while hot. What a beautiful presentation! The garlic fennel crust sounds amazing! I bet it smells magical while it’s cooking! Thanks for the temperature guide too! Super helpful! Oh wow! This really is a showstopper! What a wonderful juxtaposition of that crunchy garlic-herb coating with the tender lamb! Your photos are gorgeous and the little tips (about things like meat thermometers and French trimming) are super-helpful! What a special holiday recipe! Lamb is one of my favorites and such a treat. Yes, the flavor is unlike any other protein. 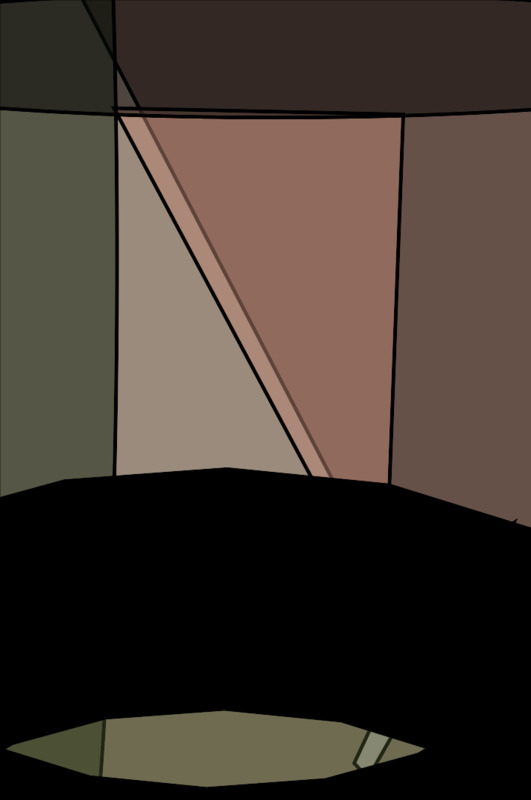 Your presentation is so beautiful too. Thanks for sharing. Lamb is like my favorite meat and we always choose to have it during the festive season. This rack of lambs looks and sounds so flavorful. The funnel is always a great flavor combination with lamb. That literally looks so mouthwateringly good!!! I’ve never made a rack of lamb but maybe I should try!! You definitely should try Anna!! This looks incredible! I’ve always been intimidated by lamb, but now I so want to try! We are humongous fans of lamb. Not only does it taste outstanding but making a cut like yours does a fantastic presentation. Fennel and garlic really compliments lamb as well as pork. This is a wonderful holiday dish. I’m saving this for Easter. Oh! It would be great for Easter too! This is perfect for a nice holiday dinner; love your presentation, as well! What a showstopper this rack of lamb is! I love the detailed instructions and I’m sure nobody can go wrong with these. Even me, who is intimidated by the prospect of a roast. Lambs one of my favorite meats! I try to always have it for our Christmas dinner.. This rack of lambs looks and sounds so flavorful. I am going to have to make this recipe this year because I have heard that funnel is always a great flavor combination with lamb. I love your photos. This rack of lamb looks perfect and too pretty to eat. Thanks for such detailed instructions, especially the temp guide! I’m always so apprehensive about preparing larger, more expensive cuts of meat because I’m worried I’ll ruin it, but your instructions leave practically zero margin for error. Thank you! You are welcome Krista! I too used to be intimidated by expensive meats and learned the hard way so that you don’t have to. I’m hope you give it a try! This looks absolutely divine. It’s so perfect for Holidays. I love lamb meat. This is something I will definitely try. Saving.